Every 30,000 miles, Lowell’s recommends flushing your car’s fluids – including coolant, brake, transmission, and power steering systems. Your car’s fluids tend to break down and get contaminated over time. How this happens depends on the fluid system. The rust inhibitors in your vehicle’s coolant (also called antifreeze) break down, causing your radiator and engine block to corrode from the inside out. These rust particles can clog the very small channels within your cooling system, interfering with its ability to cool your engine. Ultimately, your engine can overheat. Automatic transmission fluid loses its lubricating and cooling properties as it breaks down, leaving varnish and sludge deposits which can shorten your transmission’s life. Plus, transmission fluid gets contaminated with tiny metal shavings, further degrading its ability to lubricate your transmission. Brake fluid and power-steering fluid are hydraulic fluids which get contaminated as the systems’ seals and internal components break down. As they get contaminated, they lose their hydraulic properties, making it hard to brake or steer. 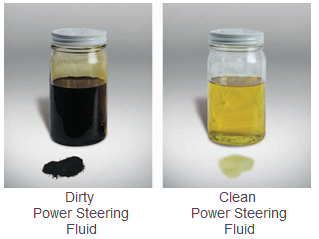 Also, hydraulic fluids attract moisture, which can introduce unwanted air into your brake and power-steering components. Changing these fluids every 30,000 miles – or whenever the fluids become dirty – can prevent expensive and inconvenient damage to your vehicle, and can help extend your vehicle’s life. So now you might understand why you need to regularly change the fluids on your car. But that doesn’t explain what a flush is (or why Lowell’s recommends flushes instead of other alternatives). Some repair shops – including some dealers – offer simple “drain-and-refill” fluid changes. This is faster (and seemingly cheaper) than a flush. They basically drain the old fluid, and top off the system with new fluid. In the process, much of the old fluid, contamination, and debris is “stranded” inside the system: old coolant and rust is left in the engine block and radiator, or degraded transmission fluid and varnish are left in the transmission. These faster and “cheaper” options will degrade the long-term performance of your vehicle and will likely create costly repair issues down the road. With few rare exceptions, Lowell’s doesn’t offer these drain-and-refill fluid changes. Instead, we perform fluid system flushes designed to remove almost all of the old fluid, contamination, and debris from the system. At the same time, the machine fills the system with fresh fluid, while adding conditioners which will help preserve the components of the system. We monitor the process until we see that all of the old fluid is flushed from your vehicle. That’s what a flush is. We recommend flushes because we believe that they are the best option for changing your vehicle’s fluids. Feel free to call the shop with any questions, and – if it is time for a fluid change or other service for your vehicle – to make an appointment for service. How much would a flush of all systems cost? I have a 2009 Toyota Tacoma with 53,689 miles. Our price to do the brake system flush, transmission flush, power steering flush, and antifreeze/coolant flush is $495 with this month’s coupon. Just let us know if you’d like to set up an appointment!